When a buoyant rising sphere exits the free surface there are several angles of trajectory and heights observed. Children experience this when playing with a ball while swimming. The pop up height and direction of trajectory above the free surface are dependent on the release depth of the sphere below the free surface. The release depth determines which ‘regime’ the sphere is experiencing when the free surface is breached. Regimes of motion through which buoyant ascending spheres transition include: steady and vertical, steady and oblique, oblique and oscillating, zigzag. 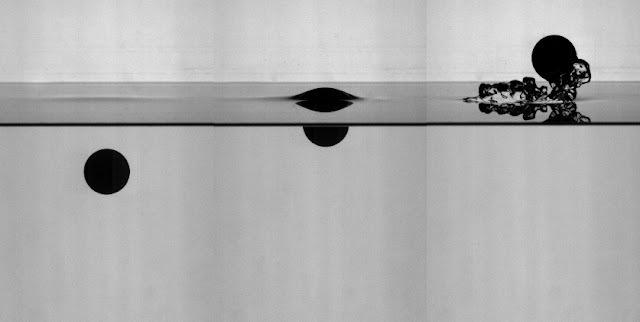 A buoyant sphere submerged in a fluid will accelerate upward when released from rest. After accelerating from rest, the motion of the sphere is initially vertical and steady (non-oscillating). The vertical path then transitions through steady oblique to a zigzag motion. The transitions in motion are caused by wake shedding behind the sphere. During acceleration, the velocity of the sphere increases, which causes the Reynolds number (Re) to increase. With increasing velocity the wake being shed changes from symmetric at low Re, to irregular at high values of Re. As Re increases the wake becomes non-symmetric and forms vortices which shed periodically and cause an imbalance of forces acting on the sphere. This imbalance of non-vertical forces leads to a horizontal component of velocity and is the cause of the nonlinear trajectory.